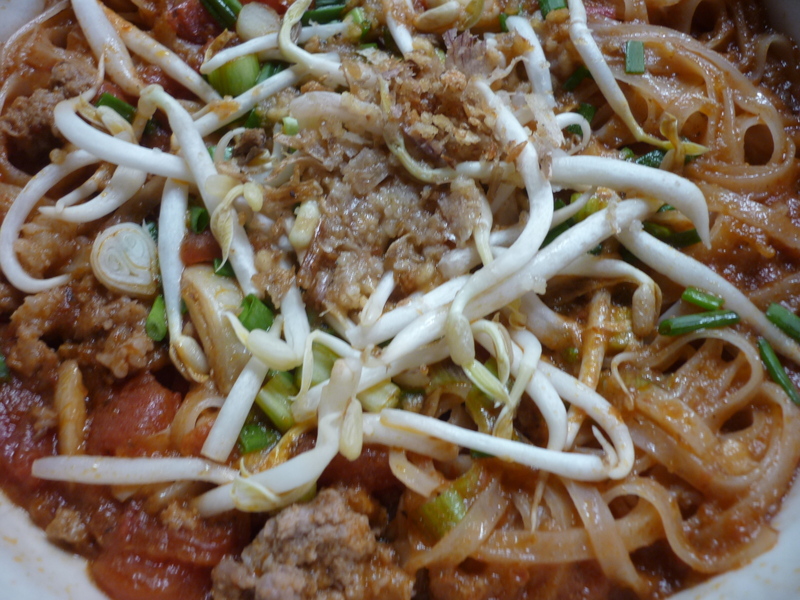 Thai Khao Soy Nam Kua uses the Nam Prik Ong sauce and thick flat noodles to form a popular lunch snack. The combination of a rich tomato and pork sauce with a good kick of chili and raw bean sprouts really gives you a different take on the standard bolognese that it resembles. Under a low heat grill the dried chillies for a few minutes until they have started to turn brown on each side. Pound all the chillies and garlic together with the salt. Stir in the soy sauce. In a frying pan over a medium heat fry the pork in a little oil for 5 minutes before stirring in the chili and garlic. Fry for a further 5 minutes. Now add shallots, tomato, and the water so it doesn’t dry or burn. Season with onion powder and salt or MSG to taste. Add the stock and stir well to make sure the pork has broken down somewhat. Cook for a final 40 minutes with a lid off until the tomato is soft and the liquid has reduced by 2/3.